Google Plus (otherwise known as Google+) is shutting down over the next 10 months due to a reported security vulnerability. Although social networks have struggled with the occasional security concern, this was likely the final nail in the coffin for the struggling social network. There have been signs for some time now that the social network may end up being shut down, but we find ourselves wondering what all of this means for the future of social media and whether it’s a sign of more things to come? Throughout the lifespan of Google Plus, there have been questionable decisions made by the management, such as forced integration into Google’s other products and many user requested features never being implemented or even acknowledged. 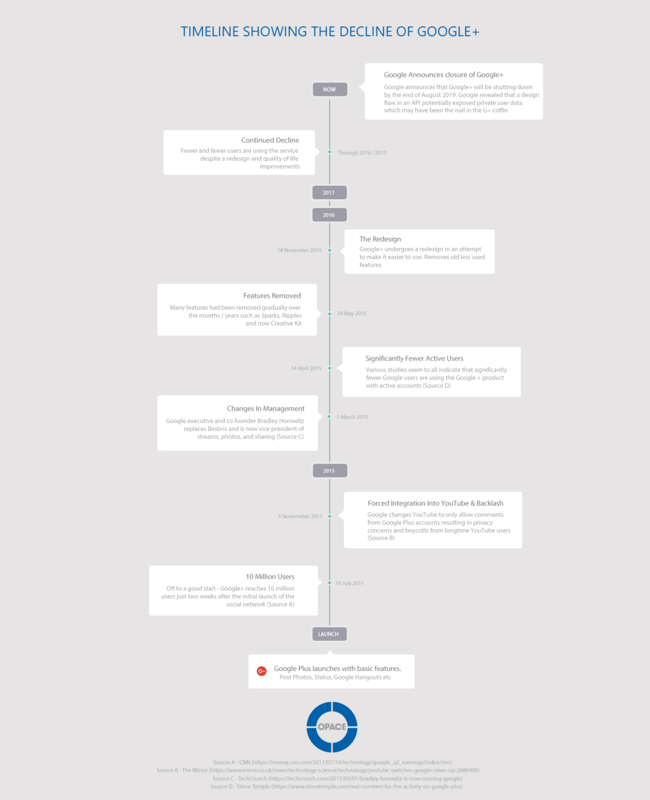 To understand where it all went wrong, we’ve created the below timeline of Google+ to show some of the key contributing factors to the network’s decline. Was the Google Plus project doomed from the start? It’s easy to conclude that Google+ was doomed from the start due to Facebook and Twitter’s popularity and their dominant positions and market share. However, it’s also easy to forget that both of these networks had their troubles occurring around the release of Google Plus, with Twitter reporting a loss of 69 million dollars for the first half of 2013. Around the same time, Facebook had a data breach exposing 6 million users. Google had an opportunity to use its reputable and established position in the tech world to bring new users over to its network by adding features that were missing from the other social networks and implementing them properly. Instead of Google trying to incentivise adoption of its ecosystem, Google started to force Google+ features into their other products, giving the end user very little say in the matter. Unsurprisingly, this caused a backlash and a boycott particularly from YouTube users, which was reported here by The Mirror. The reason for this was that in order to interact with their favourite content creators, YouTube users would need to have a Google+ account, even if all they wanted to do was leave a message in the comment section of the site. Despite the shortcomings and failures of Google+, some great technology was available in terms of functionality, but many users claim these were poorly implemented. The introduction of Google Hangouts was widely adopted for a while and seen as a great and much needed feature to those wishing to connect easily with multiple people over video. In 2016 Google upgraded Hangouts to 25 concurrent users in HD video for which was a great addition for teams that wanted to communicate simultaneously. Since then, other companies have appeared offering similar features to that of Google Hangouts such as Slack, Zoom and even Facebook Messenger. What does this mean for the future of social media, will Facebook and Twitter eventually face the same fate? After seeing a company as big as Google struggle and fail with a product like Google Plus, it somewhat eliminates the concept of being too big to fail. Users are very unforgiving when being forced to adopt changes that were never wanted or requested in the first place and rightly so. With there being so much competition in the social media space, users don’t need to tolerate forced features and inconveniences that aren’t present in other alternatives, especially when the migration / exporting of data is very easy and painless to do. Although Twitter and Facebook have had data breaches previously, they still have an very large and active user base, to a point where fixing the problem and doing damage control is worth the work and financial investment to tighten things up. They can recover. With Google+, it was just another hole in their already sinking ship – failure was just a matter of time and their latest announcement of security concerns just accelerated an already inevitable process. There are a lot of valuable lessons to learn from the failure of Google Plus that other networks will surely be taking note of. Aspects such as those relating to the roll out and testing of new features, creating an online ecosystem and dealing with security breaches are no doubt all lessons that the big names will be learning from during the death of Google+. If you have any questions, please let us know by submitting a comment below. Alternatively, please share if you found this useful.